My grandma used to make me vegetable lasagna when she would come to visit and I loved picking it at for the whole week. Now I’ve come up with my own roasted vegetable version and I think it’s a great, hearty option for a Meatless Monday or any day you want to pack in lots of vegetables and still feel satisfied. In our household, it’s a great way to use up whatever vegetables we have in the fridge before they go bad. You really can throw in just about any vegetable you’d like. This is also a great make-ahead option if you are planning on serving a crowd or if you’re dropping off a family meal for friends. Preheat the oven to 400 degrees. Slice the eggplant and zucchini into ¼ inch rounds and cut the onion, peppers, and mushrooms into ½ inch pieces. Toss the vegetables with approximately 2 tablespoons of olive oil, and season with salt, pepper, garlic powder, and Italian seasoning to taste. Spread evenly onto baking sheets and roast for about 30 minutes or until tender. Meanwhile, mix together the ricotta, half of the mozzarella, parmesan, spinach, and Italian seasoning in a bowl. During the last ten minutes of roasting, prepare the lasagna noodles according to package instructions and strain. They may stick together if they are left to rest too long, but running them under water can help to pull them apart. Oil a baking pan and spoon enough sauce to coat the bottom before beginning to layer the lasagna. Lay the first layer of noodles and top with the eggplant and zucchini, then cover the vegetables with sauce. Then, lay down another layer of noodles and spread half of the ricotta mixture. If you’re not afraid to get dirty, smushing this around with your hands seems to work best. On the next layer of noodles, spread the onions, peppers, and mushrooms and cover with more sauce. Then add one more layer of the ricotta mixture. Finally, cover the last layer of noodles with the remaining sauce, optional fresh basil, and the rest of the mozzarella. At this point you can cover the dish and freeze it for later or bake it 400 degrees for approximately 30-40 minutes or until cheese is melted and beginning to brown. Let rest for at least twenty minutes before slicing and enjoy! 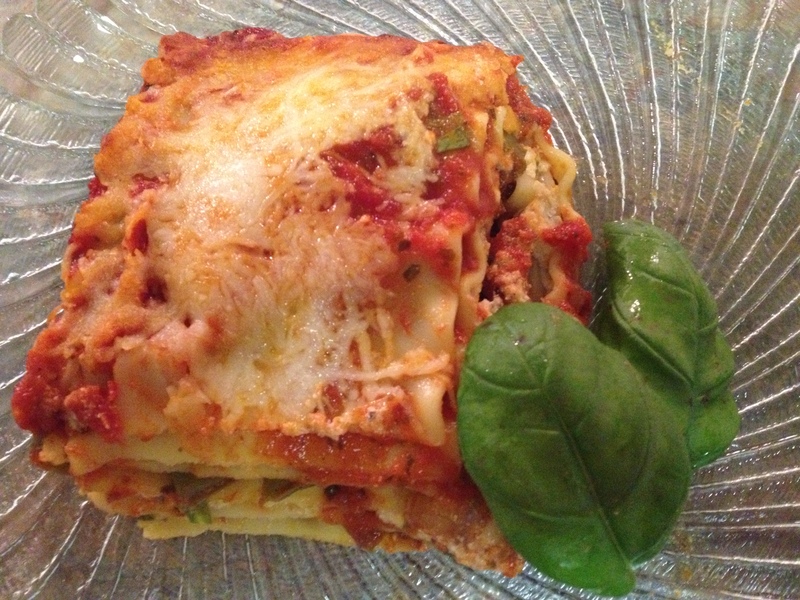 The fresh basil in this recipe is optional but adds a great burst of freshness to the dish. It also makes a perfect garnish if you like to make food look as good as it tastes. 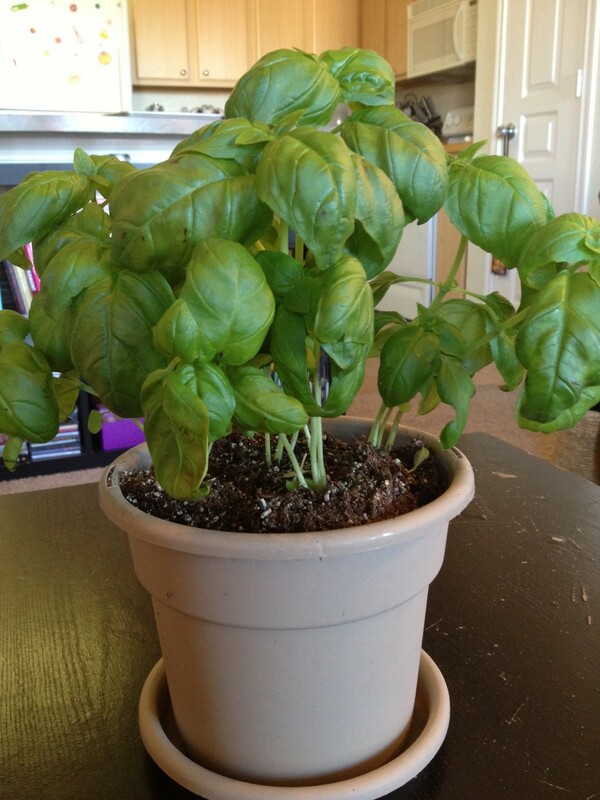 This is another herb that I would recommend starting with if you have any interest in a home herb garden. It’s relatively easy to find, inexpensive, and easy to maintain. Just make sure it gets lots of light, water thoroughly approximately once each week, and pinch off leaves from the top of each stem rather than the bottom to promote bushy growth.